SPRING FEVER RELIEVER WEEK: Student leaders jumped on this to raise money for prom. Monday is neon day. Join the kids in this fun celebration! Listen each day for what the next day dress code will be. Tuesday – Senior Class meeting in the auditorium. This is the entire class where they vote on class song and learn information about graduation. Yes, graduation. Wednesday – Leadership Team Meeting at 7:00 a.m. in Room 106, tornado drill at 1:15 p.m. and NHS Induction at 6:00 p.m. in the auditorium. Junior/Senior class sponsors are invited. Reception follows in the Modis Gym. Friday is faculty lunch day. Yum. “A light bulb but no (good) ideas… (17/365)” available in CC on Flickr by Lifesupercharger; “Head in Hands” by Alex E. Proimos; “Wit and Wisdom of Winston – Oct 2010 – Westerham Pub Wall – Those Two Imposters” by gareth1953 Friends please read my profile. New Upd. And this week will fly by like the crazy winds I hear we will be experiencing this coming week. Monday iZ someone specialZ birthday. (also DS…know who that is?) Please make sure you spread the word! Wednesday is ACT Academy first session for the April test. Mrs. Steeby will be talking to the kids on Monday and a finalized list will be sent to you all. Also Wednesday is our Project Lead the Way Certification visit during the entire morning hours. Please support your IT team and Mr. Burright as they work through this process. Friday is our Spring Sports Assembly. Normal pep assembly schedule. Coach Z has the agenda and will release it on Thursday. Finally, SATURDAY is a momentous day for Benton! We will be walking a neighborhood leaving flyers about our election from 8:30 (meet at the East Hills Mall library) to get materials, and pass stuff out until you’re done. It’s that simple. Then, at noon, join us in our CELEBRATION and ground breaking ceremony for our Field House. There will be a short ceremony and then a reception following. It sure would be awesome if our staff could come for the 30 minute event bringing your children and spouses with you. How amazing would that look on the news! We will have balloons, cake and conversation. Short and sweet. Please don’t miss out on making a difference then on making the news! Inspiration doesn’t recognize boundaries. Interestingly, my inspiration for insight into Benton’s progress so far this year along our journey toward excellence came from the sermon in church this morning. I’m guessing “inspiration” isn’t interested in separation of church and state, so if that is a boundary for you, please know you do not need to read any further. If you are open to inspiration from every venue of life, you will understand that in the process of reflecting on today’s message from my pastor, Dr. Darrell Jones of Grace Evangelical Church, I realized the message did not apply only to my family – as timely and perfect as it is – but that it also applied to my work family for all the same reasons. The inspiration in the message came in a nugget where Dr. Jones shared how efficient, hardworking, smart people look at a successful journey as the shortest route from “Point A” to Point B,,” so much so that we often look for a formula for efficiency. I agreed; in education, we live our lives as efficient, hardworking people attempting to wisely map out that successful route day after day. But where the insightful “Aha!” moment in the message came for me was when Dr. Jones shared how God has a different measure of success for the journey. His goal is not as much about reaching the destination, but about the JOURNEY taken to get there. It is along the journey that we learn things – big things – and that we grow in relationship with God. For me, His model for relationships extends to all relationships grown along my journey. I learned this today…I need to relish that journey. I need to make sure I take notice of the incredible lessons learned along the way (some at a great price), and I need to grow, honor and value the relationships that I make along the path toward growing Benton’s excellence. We met with several more data teams, and the final work continues to show signs of success in your efforts. Thank you yet again for staying with us along this crazy journey. It’s exciting to see how much everyone has grown. In this next week, we will begin taking score (see “A Look Ahead” below). As I shared with our Special Services Directors on Friday, who by the way were blown away with the data teams work and progress made by our Special Services department, how if they (directors) had talked with our teachers about the data teams process during first quarter, the teachers in that department would have told you what they have now accomplished was not possible Not only was it possible, the journey offered us all deep learning and great insight into one of the toughest areas to break through with a teacher – examining pedagogy. We are entering the season of measurement. It’s now time to take score on all our work we have done this year. It is my hope that our score reflects our wins along our journey of excellence. Our students take most of the assessments/measurements, but a few significant measures completely belong to us. We need to really consider what that means. First of all, we will begin TSA testing this week and next. Students in FACS and Business who have completed a DESE designated set of courses take this exam. The test is rigorous, but we feel like we will perform solidly. Once the testing list is released, please encourage these students, even if the test isn’t in your department. If we learned anything this year through our data teams study it’s that we each have an impact on student learning. If you have any of these students, you helped contribute to his or her success. I am sure that child would love to hear that encouragement from you. This Thursday is our District Walkthrough. We, as a staff and administrators, completely own this measure. After meeting with each data team, I feel we are prepared and know our work is true. More than anything, I know we can show your work and explain it thoroughly. You have really worked hard this year. It is my honor to represent you, your work, and our school to district leadership. Before we get to Thursday, I want to thank you for your work. Thank you for trying. Thank you for taking this journey with us. No one tells you enough, but we are so grateful each day for your efforts with our students. Thursday’s review will affirm that work. Stay posted. We will let you know. One last measure we will start giving this Friday and the beginning of next week is the DESE AQ Survey. This is also one measure that we own completely. As I was reminded just this morning, it is the journey that is important. The learning and relationships are a part of that journey. It didn’t come without hard work, but it has made an incredible difference. 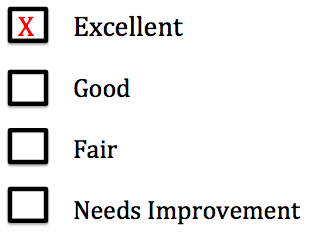 It is my hope for each of you that the results from our survey reflect our school’s journey toward excellence. You deserve that affirmation. 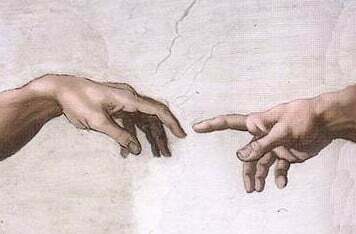 “Points A, B” from me; “Hands of God and Adam” available in CC from Wikimedia file; “Comments and faves” available CC in Flikr by cessami; “Priorities” available CC in Flikr by catd_mitchell; Graded by me. If a man is called to be a streetsweeper, he should sweep streets even as Michelangelo painted, or Beethoven composed music, or Shakespeare wrote poetry. He should sweep streets so well that all the hosts of heaven and earth will pause to say, here lived a great streetsweeper who did his job well. ~Martin Luther King Jr.
As we progress through our second semester data teams review, it is obvious our professional development has paid off this year. The resulting work is excellent. I am grateful for every “Aha!” moment that each set of teachers arrived at due to the process of studying and implementing data teams. It was just seven short months ago that we felt overwhelmed by this process. I am so proud of how the teams embraced the learning and held strong through the implementation. In this season of planting for the next year, I want everyone to know that it is the excellence within our halls that enables Benton to travel this journey of excellence. If you are part of a data team, your leadership will be essential next year as we work to grow our learning into blossoms for all to see. Next year, we will continue our work with 1) data teams, 2) technology integration, and 3) finding ways to connect our students with their learning. What are we missing? What do we, or more importantly – what do you need to learn in order to operate in your classroom more efficiently and effectively? The SIP team needs your input. I talked to CAMP Congress last week about our progress this year. You all would have been so proud to hear the kids speak about their school. They believe we have accomplished several of our goals this year. They feel safer. They know you care about their learning and their future, they love the new technology, and they are happy that their lunch service is improving with the salad bar. And they gave us quite a list to consider for next year. Their ideas are great, and they feel empowered by their teachers to make a difference. Thank you for that! I will summarize and send out their input for discussion with the BLT to share with you at our leadership meeting this week. Monday night you have an opportunity to meet the new school board candidates at TMC at 6:30p.m. Feel free to come with us to represent Benton. Other than that, we have a pretty standard week. Don’t forget to help our students improve their literacy by following through with vocabulary, SSR and Eyes Past Print. It’s CAMP grade review week. It is our responsibility to make sure our students know how much their education means to us, and how much their success depends on their dedication to school. If we don’t tell them, they may not hear it from anyone else. As you talk to your students about their 3rd quarter grades this week, feel free to take some time and connect their need for your course to their goals for the future. If they want and intend to go to college or get a job after high school, what specifically are they doing to make sure they reach that goal? Like the flowers of spring, we must grow this thinking in our students. What behaviors do they need to water? What weeds do they need pull? We need to give our students constant reminders that achieving their goal is not hard, but it does take work. We are here to make sure they don’t “opt” out of achieving their dream. This is a great week to share that with them. Make sure you also follow through by your actions. It’s important that we are the educational role models in their lives. Having had a son graduate from Benton, I know for a fact that it was teachers at Benton expecting him to succeed that sealed that desire in my own child. We have 851 students. At Benton, I know our excellence springs internal. All images are CC from Flickr: “The Perfect Shade of Princess Pink” by Pink Sherbet Photography; “Lupenis Texensis” by Jason A. Samfield; “Sprung” by Roberts S. Donovan; “Reach up for the sky” by jenny downing; “369 Flower on Blue” by I Am Not I.